I was planning to have a pig out session at Myeong-dong Street and thereafter, visit the famous Namsan Tower as the way to the Namsan cable car station is accessible from Myeong-dong Street. A trip to Seoul is not complete without a visit to Myeong-dong - a street famous for its mouth-watering street food and there are also many fashion and cosmetics shops to explore. 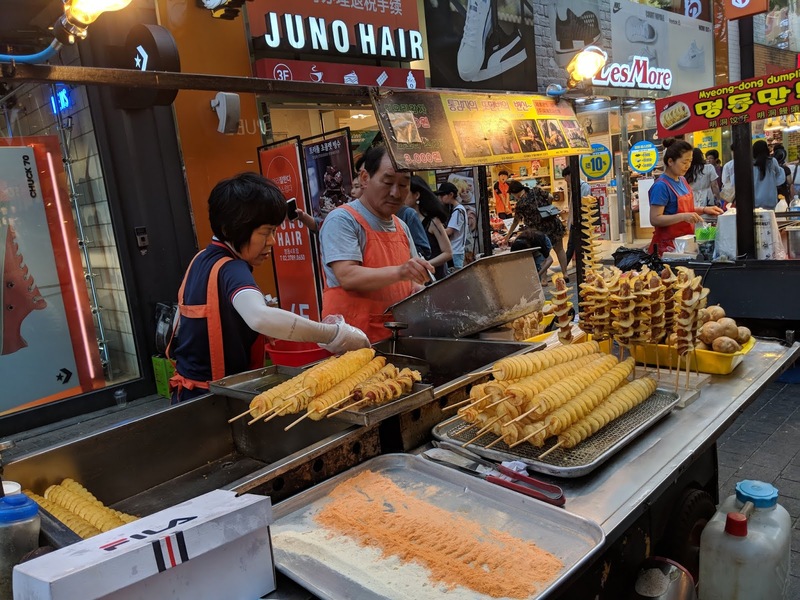 When I reached Myeong-dong, I was energised by the food stalls selling different types of street food. I am sure fellow foodies will understand this adrenaline rush upon seeing yummy food! I will be sharing my foodie experiences, my Namsan adventure and the pitfalls to avoid. By the way, eating street food in Seoul is much more expensive than dining in a Korean restaurant! 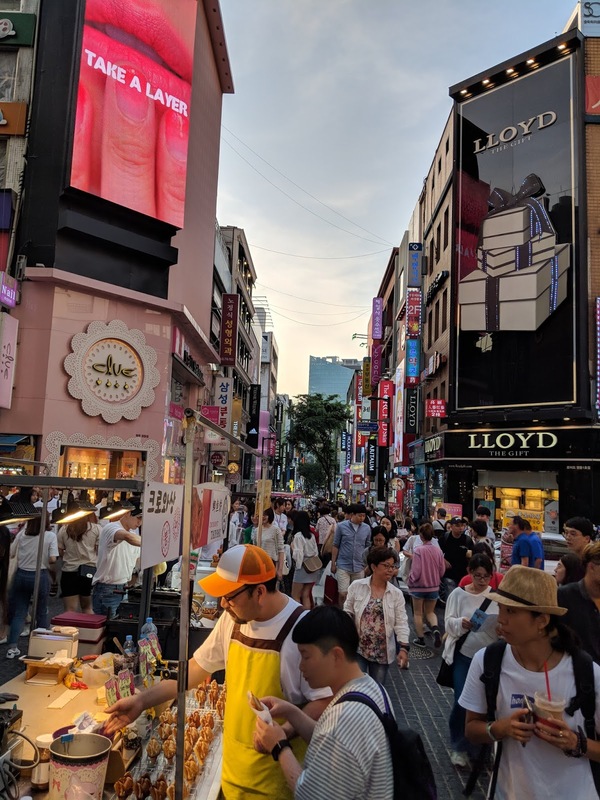 The moment I reached the main food street of Myeong-dong, I was dazzled by the colourful buildings selling fashion clothing, accessories, cosmetics and skincare products. As my intention was to explore the food section, I did not shop at Myeong-dong. For shopping guide, click here. What street food to eat at Myeong-dong? 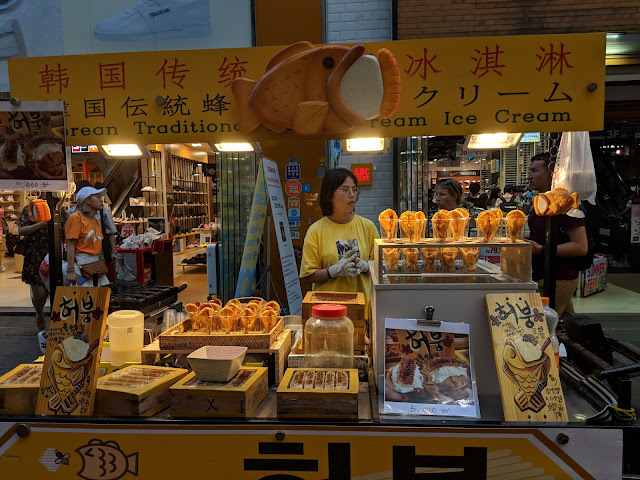 I know that there are some Taiyaki fans out there and tada, you will be very happy to find them at Myeong-dong! Taiyaki Croissants were first made famous in Japan and thereafter spread to the other parts of Asia. The texture is similar to a fluffy and crispy croissant and you can choose the type of filling from savoury to sweet. Enjoy! 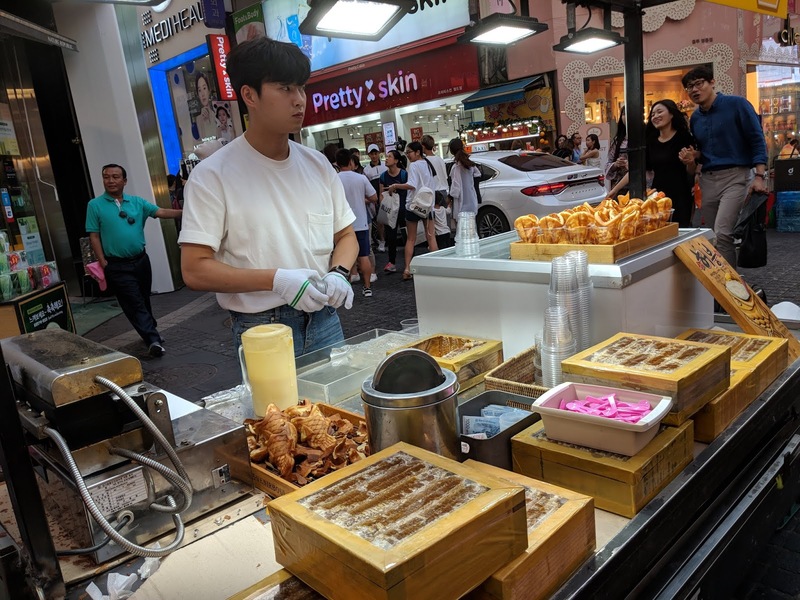 One frivolous thing that I observed was that there were many youngsters selling food! I felt like I was in a Korean drama surrounded by pretty faces! Another type of Taiyaki came in the form of a cone with ice-cream and a honeycomb. It sounds very delicious right? The price was quite expensive and the queue could be long too. 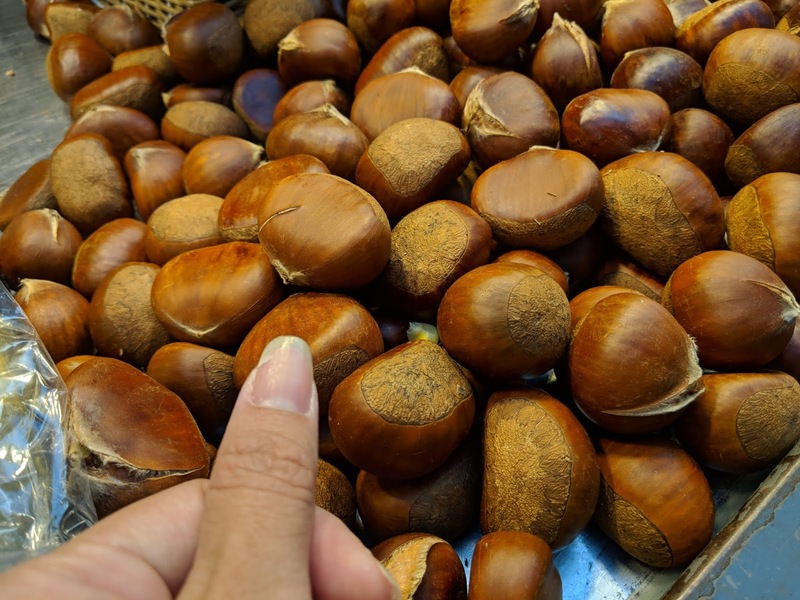 For roasted chestnut lovers, you will be screaming with delight because these were one of the biggest roasted chestnuts I have ever come across! I even sacrifice posing my broken nail for the camera just to show you the size. I am always imagining that I am on a low carbohydrate diet. 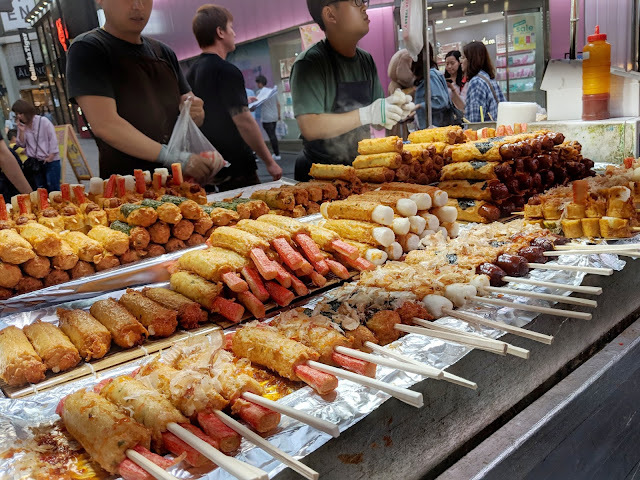 But if you are afraid that you will starve on sticks of street food, fret not. 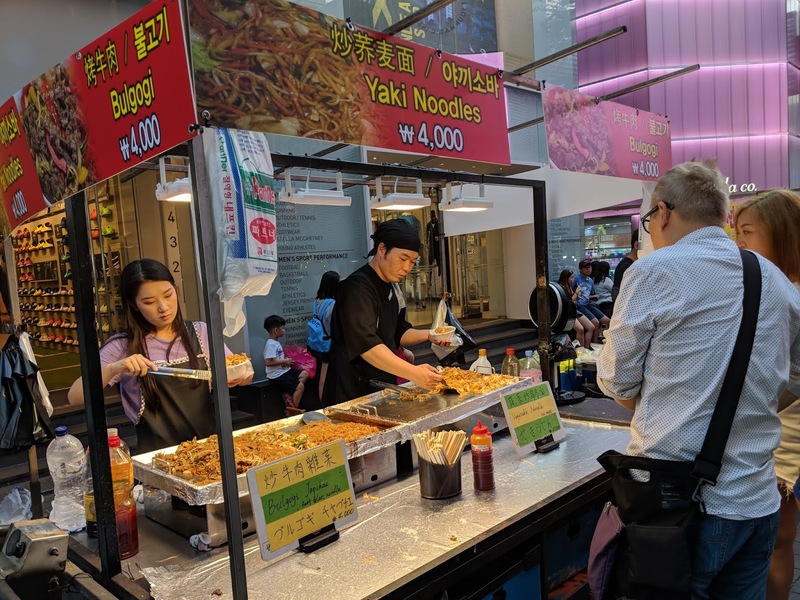 There were some decent stalls selling carbo such as Yaki Noodles, potatoes twirls and Korean Sushi called Kimbap. 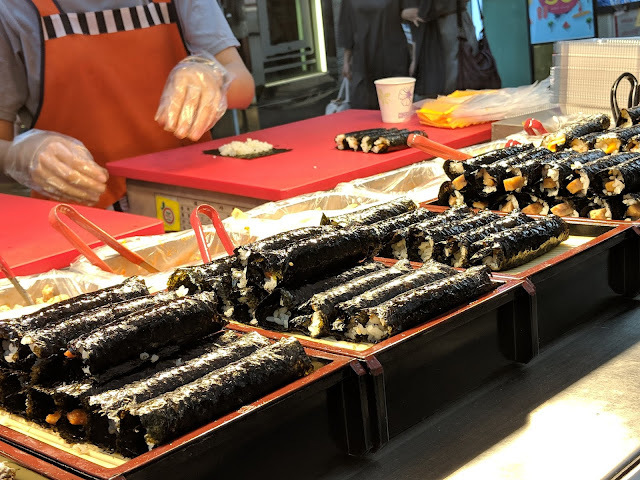 Kimbap are sushi rice wrapped with filling and seaweed. 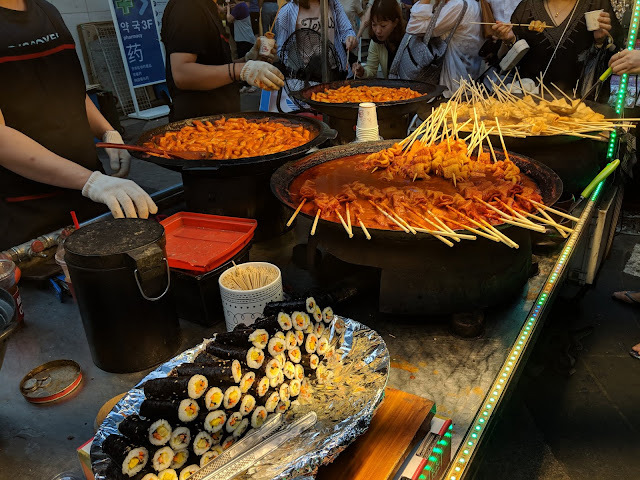 There were Kimbap in most street food markets so it is okay if you want to fill your stomach with something else in Myeong-dong. In fact, I would suggest you try the Kimbap at Gwangjang market because they looked fresher. I paid S$18 for my lobster! I was pacing up and down the street deciding if I should eat the lobster. It looked very good! I finally tried it. 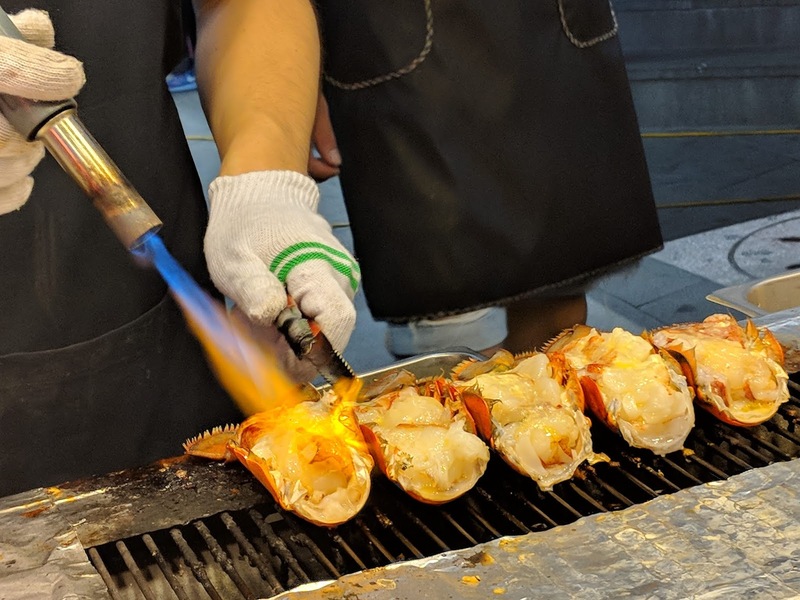 The lobster was very fresh and the meat was very chunky. For cheese lovers, you will be in heaven. 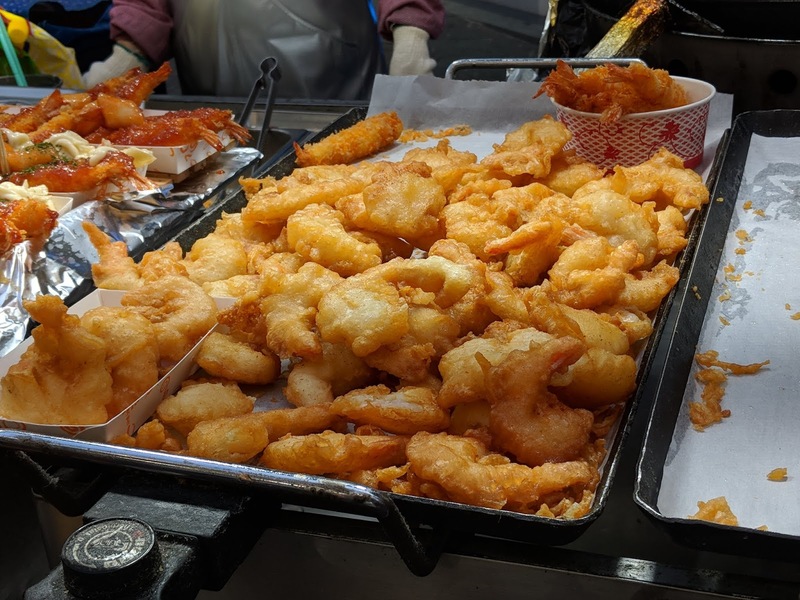 If you are allergic to lobster, there were also deep fried prawns fritters and scallops cooked in butter sauce! 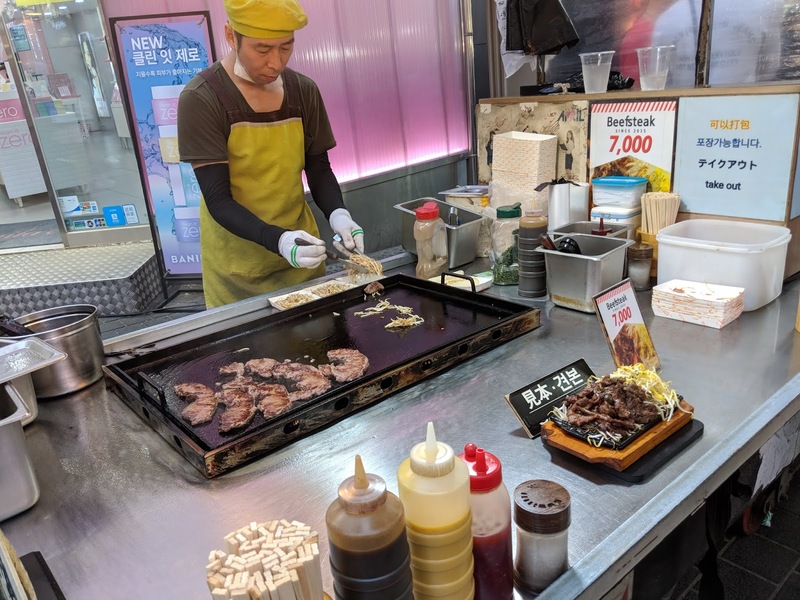 I also saw many stalls selling grilled meat such as beef steaks and meat on sticks which reminded me of Yakitori in Japan. 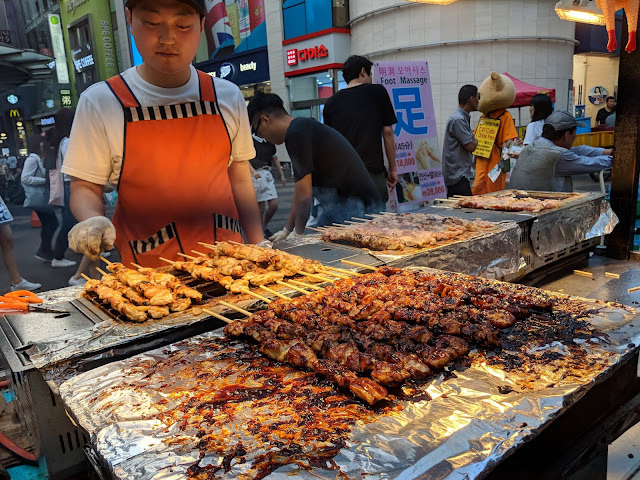 The aroma of grilled meat was very alluring. 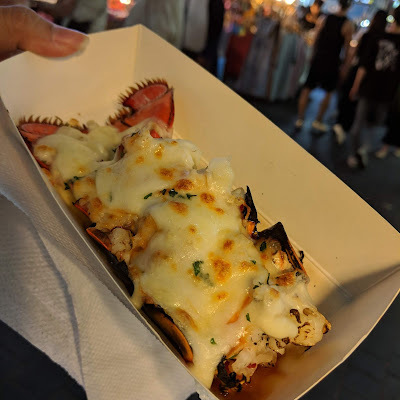 As I had already spent so much on my lobster, I had to skip the meat and go straight to the traditional Korean food. 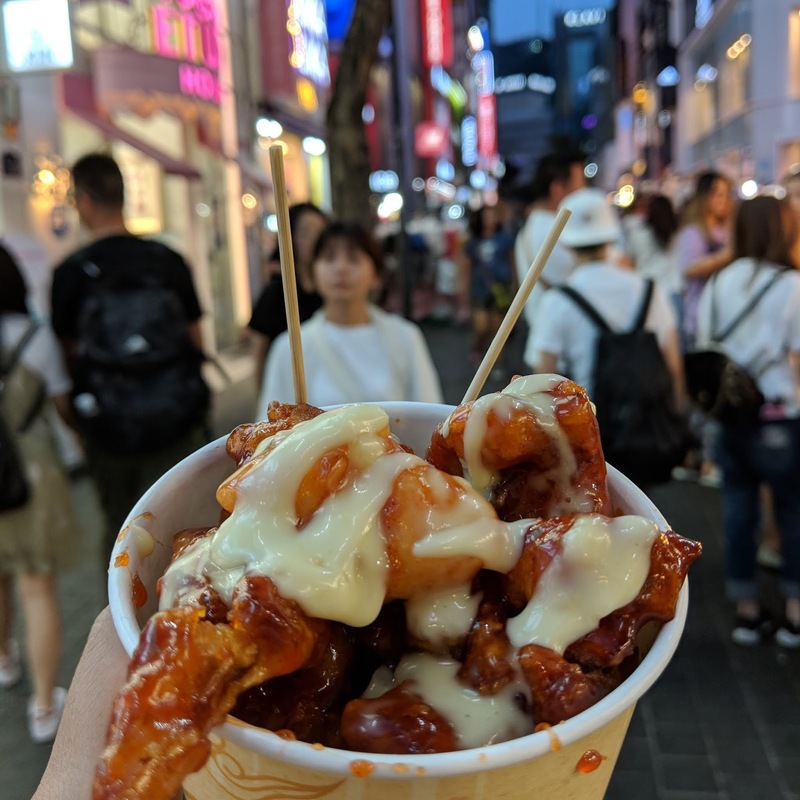 TTEOKBOKKI with Fried Chicken and Cheese! Tteokbokki refers to traditional Korean rice cakes cooked in a sticky sweet and sour sauce. This tub of awesome goodness with melted cheese sauce was unforgettable! I finished everything on my own! 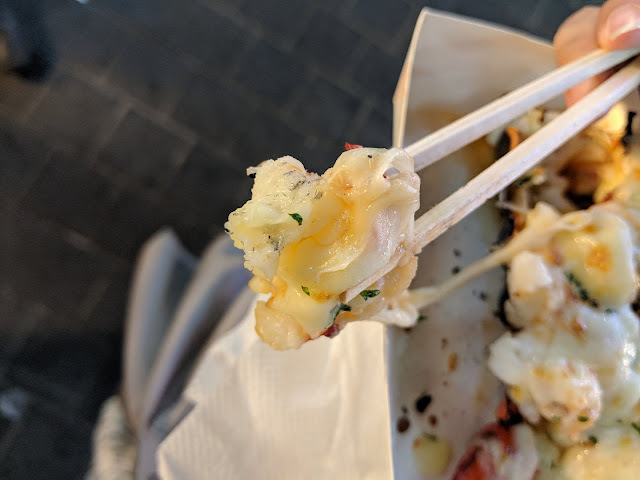 The Tteokbokki and the sauce tasted nothing like the ones in Singapore because the Singapore version of Korean rice cakes were soggy and gross whereas the Korean original version was cooked al-dente. 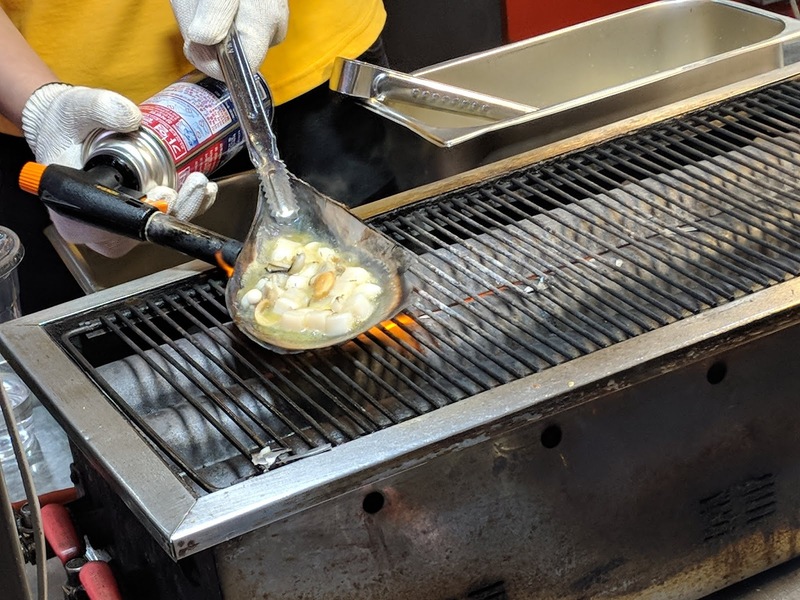 The sauce was extremely fragrant to the point of shiok. 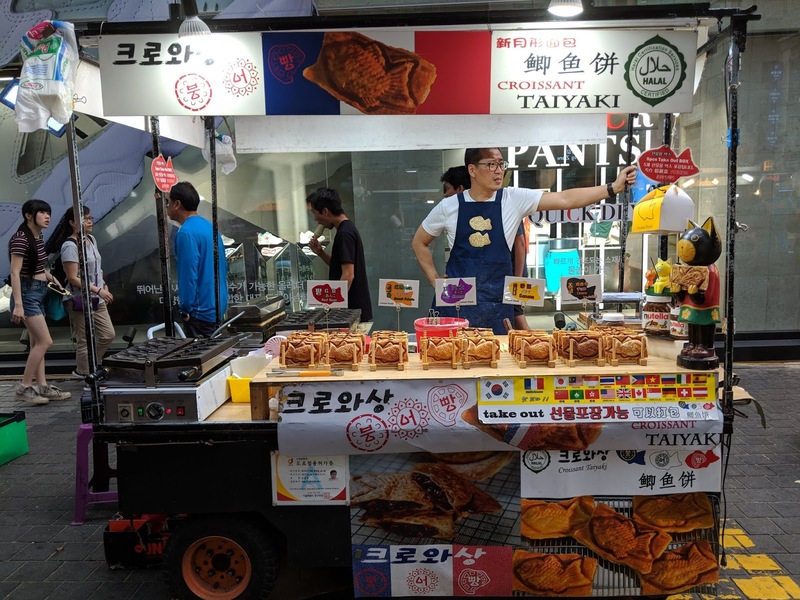 The Korean fried chicken which was made popular by a Korean drama about aliens, was also a perfect combination to the rice cakes. I have a tip for you. Read carefully - Although the stallholders were cooking live, it does not mean that you will get a tub of piping hot goodness. To my shock, some of them would pass you the unsold ones which had already gone cold. If you are very particular about the freshness of food, you should request for a fresh one. Therefore, make sure you request for a fresh tub of Tteokbokki with fried chicken and cheese. 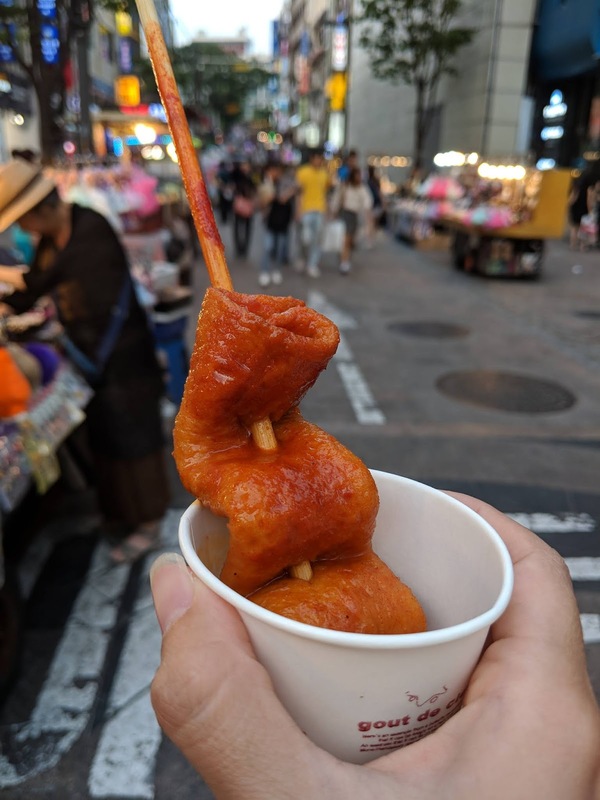 Odeng is a traditional Korean street food and refers to fishcakes skewered on sticks. They were available in spicy and non-spicy versions. I purchased the spicy version and it was so spicy that I had to buy fresh orange juice to put out the fire! If you cannot take spice, you better stick to the non-spicy version. 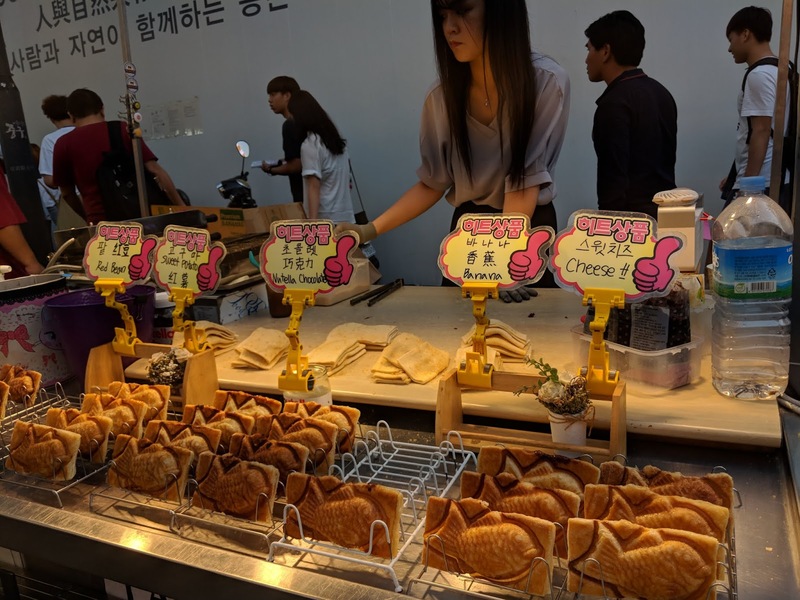 To be honest, it was not mind blowing but it was sooooo Korean. Try it! 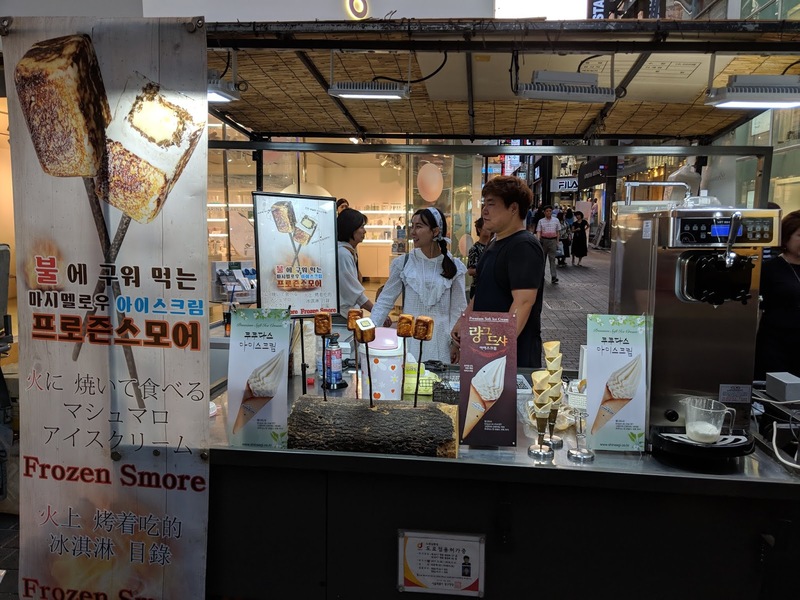 There were a few stalls selling ice-cream for dessert and the most interesting one is Frozen Smore. Smore refers to marshmellows. 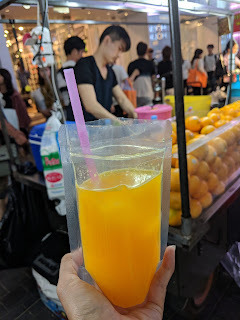 After having a dessert to end a satisfying street food hunt, it was time to do some cheap shopping. 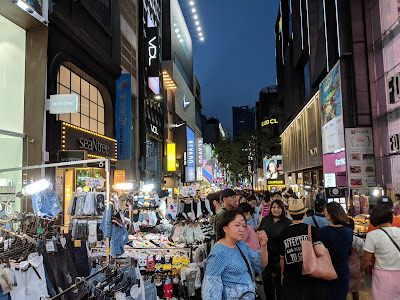 Surprisingly, although Myeong-dong is a famous shopping street with branded shops, it also has stalls selling stuff at very reasonable prices. For example, the socks and earrings cost around S$1 to S$2 and they were of good quality. I bought a pair of Line Bear socks and they were very cute and comfortable. The sun had set and it was time to go to Namsan Cable Car station. 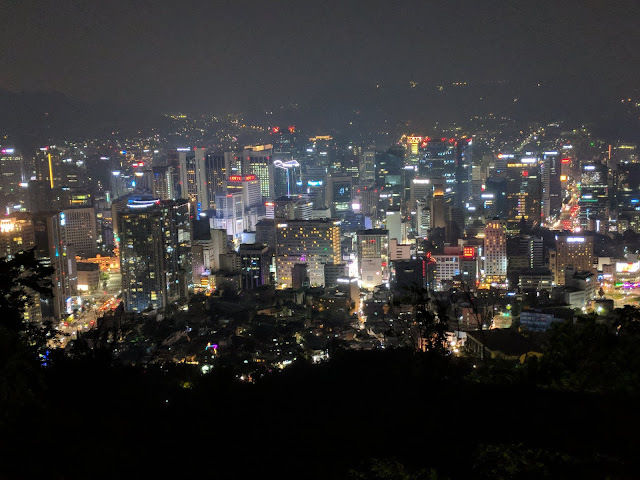 I wanted to take the cable car to Namsan Tower so that I could catch the night view of Seoul. It was not a good decision because guess what happened? 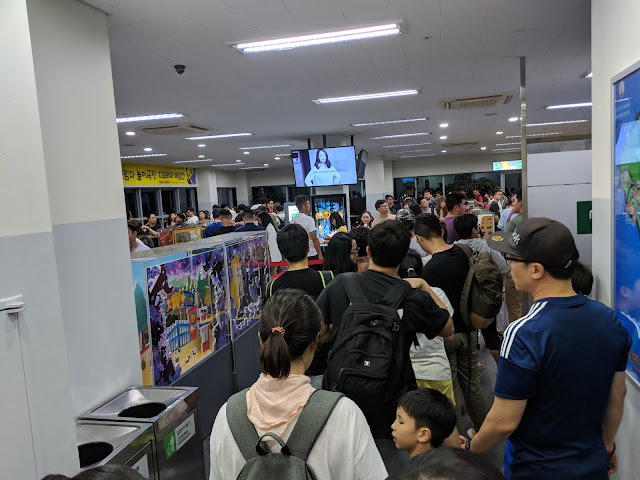 The queue at Namsan Cable Car station was as long as a dragon! Please do not make the same mistake. 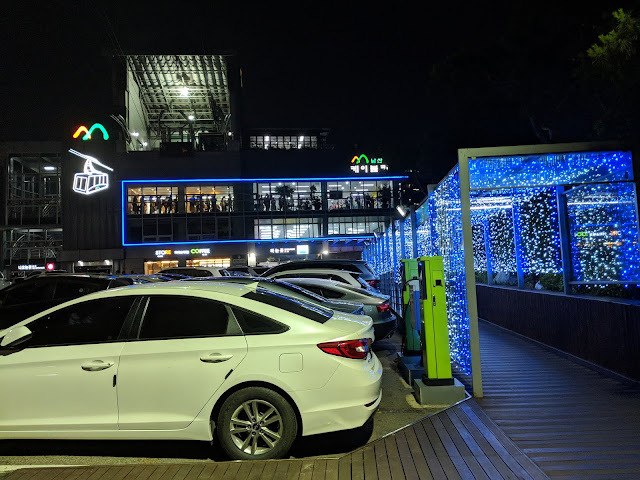 Go to Namsan before the sun sets. 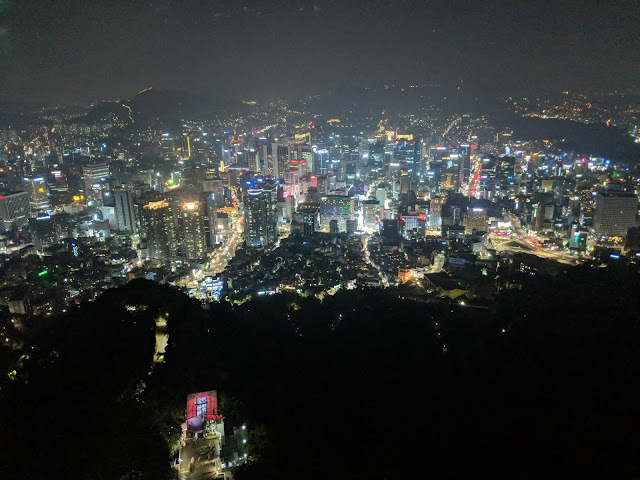 How to go to Namsan Tower from Myeong-dong? Namsan Tower is iconic and beautiful. It is definitely a Must Go especially for Korean Drama fans. 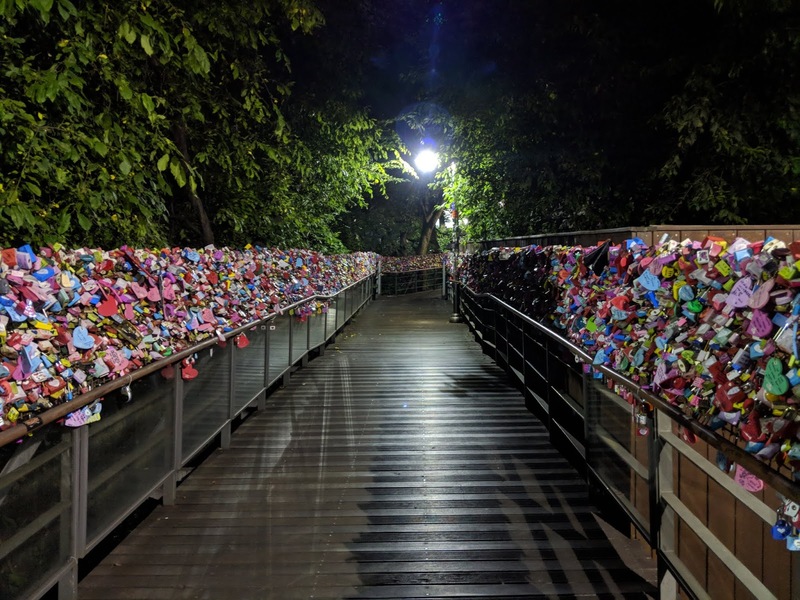 This is the place whereby the male and female characters will declare their undying love for one another by placing a padlock on the fence. Namsan Tower also provides a sweeping view of the Seoul skyline. Awesome! After reading many blogs, I was still confused. I only have one advice for you: Look for PACIFIC HOTEL! It is visible from the food street. Go towards the Pacific Hotel. Once you reach Pacific Hotel, you have to walk for 10 minutes on the right side of the hotel. You can click here for more information. Am I reaching the cable car station soon? 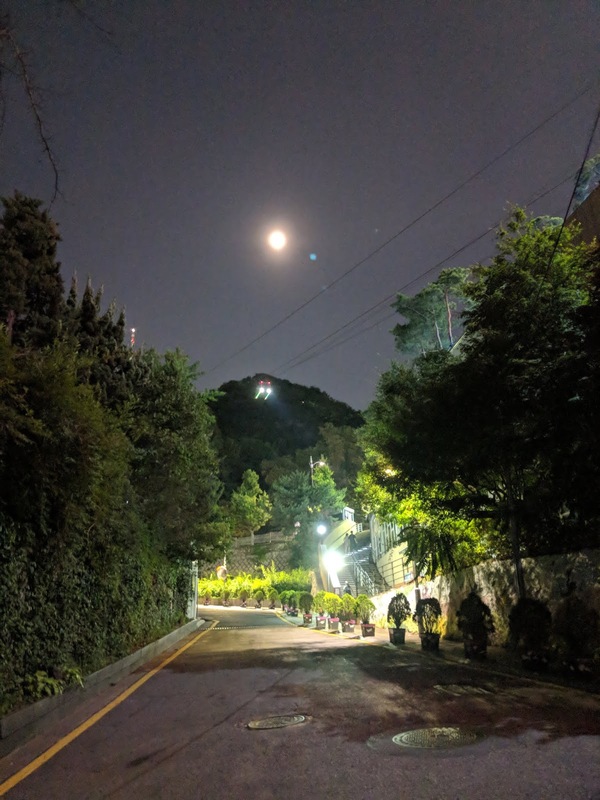 It was a quiet road all the way to the cable car station. Trust your instinct and the people walking up. If not, just ask. Google Walk function completely failed me in Seoul. Yeah! I think I am on the right track! I was very happy when I saw the cable car station. My happiness soon turned into a OMGosh emoticon. I was aghast when I saw the queue for the cable car! I queued for more than an hour! 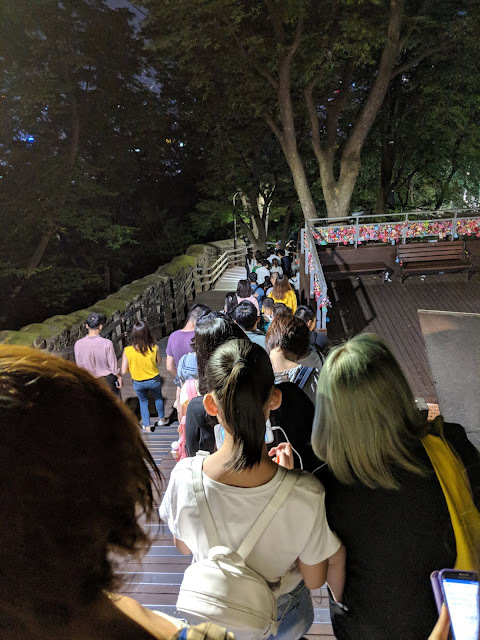 Together with that many people, we had limited time at the Namsan Tower because it had a closing time! The cable car ride was scary because it was shaky with MANY people. People were making woo woo ah ah sounds whenever the cable car shook in the wind. Nonetheless, I tried to make the best out of it by taking pictures. Sometimes, taking pictures help to calm your nerves and lower the level of anxiety. Once I entered the Namsan grounds, it was beautiful. 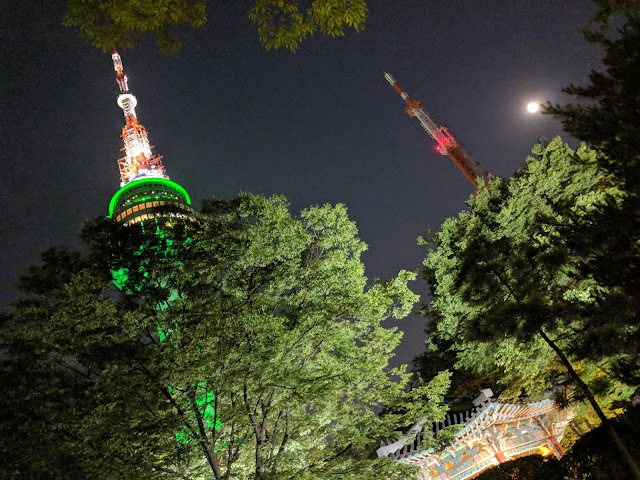 I saw a lovely Korean pavilion with people relaxing and admiring the moonlight. How I wish I could join them! 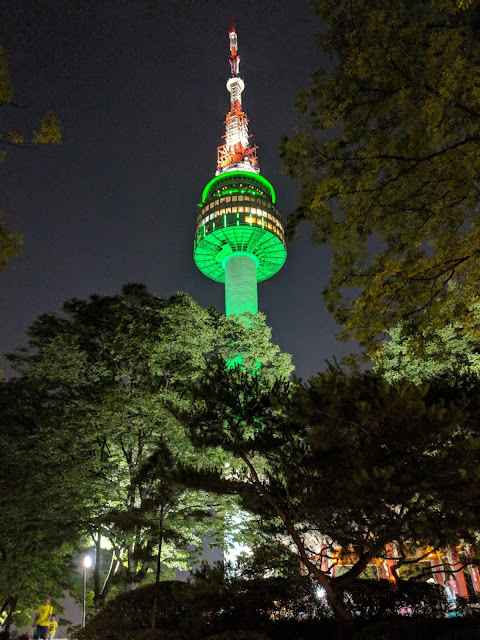 I could not because the Namsan Tower was going to close! 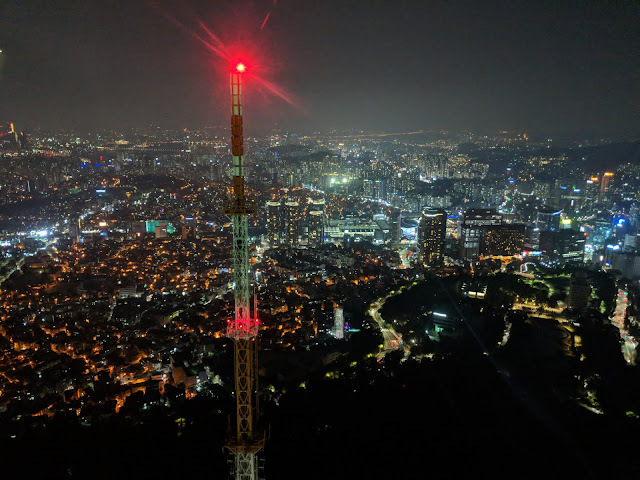 I went straight to the the tower and went to the top! The view was great! 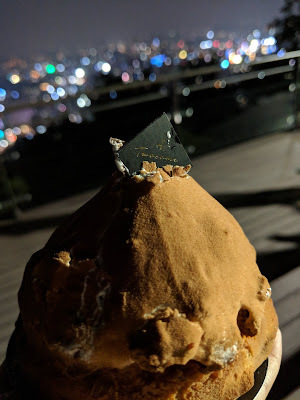 After admiring the night view of the city, I bought a chocolate dessert to make up for the time I spent queuing. Once the happiness coins in my Happiness Piggy Bank are low, I need to top up. I definitely felt happier as I took some time off to enjoy my dessert at the park. 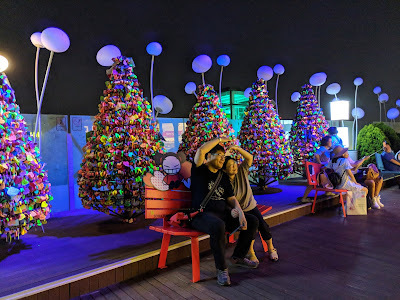 I saT down with the other couples and for the first time ever since I tried to travel alone, I felt lonely. I wish there was someone, may it be a good friend or a loved one, to share that moment with me because it was very beautiful. I shook the thoughts off and reminded myself that at least I had Mr Chocolate Dessert with me. I sat down and soaked in the beautiful view in front of me. Very relaxing. 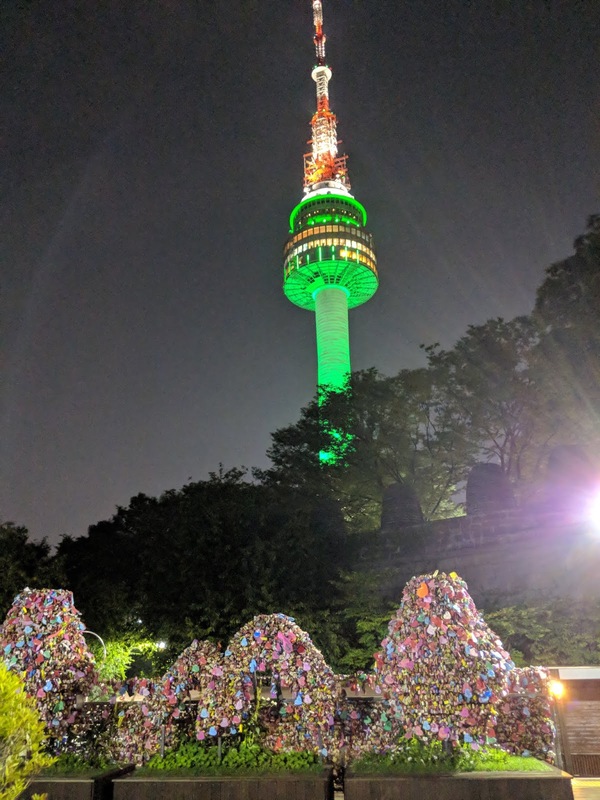 At the Namsan Tower area, there were also love locks everywhere. When modern romantic love strikes, it takes hold of your entire being and you know for sure that this is the person forever. This very special moment was captured in the many locks that were before me. It was time to say goodbye to the Love Locks. I had a bad feeling that the queue for the cable car would be long. Wow, it was very long. During the queue, I learnt a lot about faith. 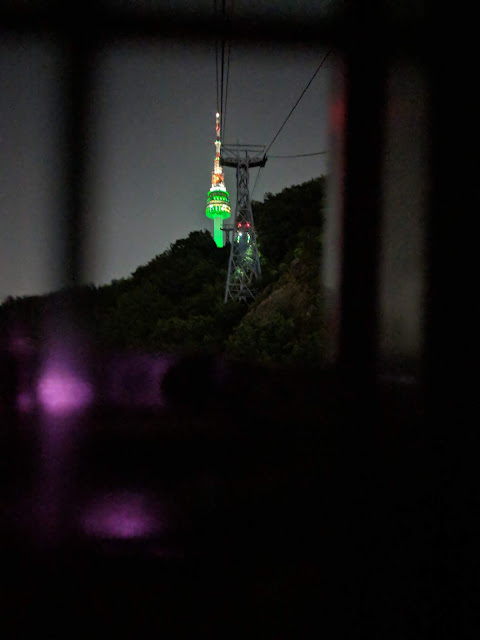 The closing time for the cable car station was approaching. I was wondering if the queue was in vain. Would I be rejected at the station by the time it was my turn? I was not the only one having such thoughts. A couple right behind me was having a discussion. The boyfriend wanted to use his two legs to walk down. The girlfriend wanted to continue to queue. When unsure, just follow your heart because most of the time, it has already influenced your brain. How to follow? Just be still and observe your feelings. Your heart and body will take over. So, haha. 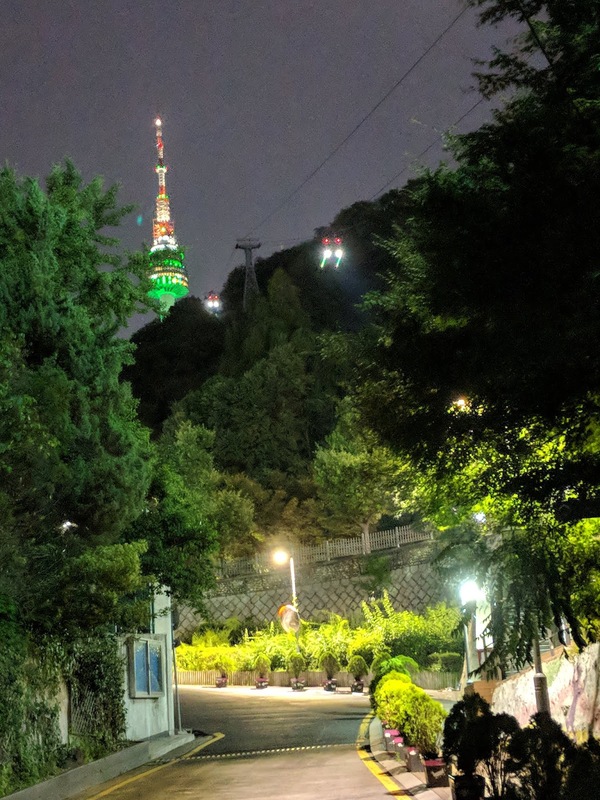 I was still and I waited patiently for my turn, keeping my faith in the Seoul Cable Car station. Hey! amazing food experiences shared by you, I really like the cuisines they seems amazing. For more you can opt for West End restaurants Edmonton for special dishes.